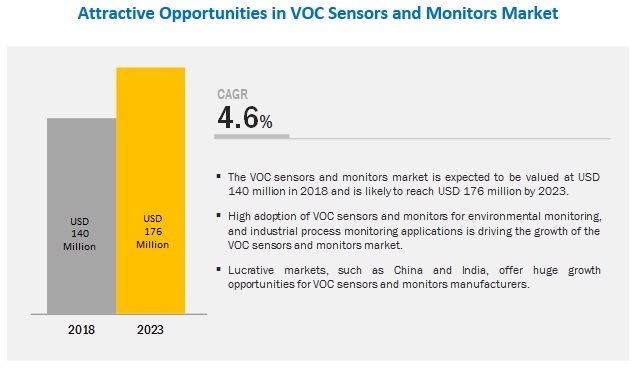 [101 Pages Report] The volatile organic compound (VOC) sensors and monitors market is expected to grow from USD 140 million in 2018 to USD 176 million by 2023, at a CAGR of 4.6% during the forecast period. Increasing enforcement of occupational health and safety regulations by governments is one of the prime factors driving the VOC sensors and monitors market. Apart from this, growing awareness regarding controlled air quality, and rising demand for VOC sensors and monitors from developing countries are other major factors fueling the growth of the said market. The VOC sensors and monitors market, by device type, is segmented into monitors and sensors. The monitors segment is expected to dominate and witness significant growth during the forecast period. Increasing implementation of rules and regulations by government bodies to ensure occupational health and safety of employees is the factor spurring the growth of the market for gas sensors as well as VOC monitors. Safety regulations are an important part of any industry, especially in the accident-prone industries such as oil & gas, chemicals, and building and construction. The market for the air purification and monitoring application is expected to witness significant growth during the forecast period. Air pollution is becoming one of the most influential environmental risk factors in urban areas. It occurs when harmful substances, including gasses or particles, are introduced into the earth’s atmosphere, which directly affects the health and comfort of human beings. The adverse effects of air pollution are not just limited to the outdoor environment; it also affects the indoor environments. North America is expected to account for the largest share of the VOC sensors and monitors market during the forecast period. One of the major factors contributing to the leading position of North America is the high demand for VOC sensors and monitors from the US. The US is the leading producer of VOC sensors and monitors, with a large number of manufacturers investing in R&D to develop advanced products integrated with the gas sensing technology. Key players in the VOC sensors and monitors market include FIGARO (Japan), ams AG (Austria), Alphasense (UK), Drägerwerk (Germany), Honeywell (US), Aeroqual (New Zealand), Siemens (Germany), Extech (US), Global Detection Systems (US), and USHIO (Japan). Honeywell (US) is a well-known player in the VOC sensors and monitors market. The company has a wide portfolio of products for detecting VOCs in critical gas sensing applications. For strengthening its position in the gas sensors market, it mainly focuses on gas sensors used in hostile environments. The company is expanding its product reach in different regions with product innovations and product launches for which it primarily focuses on R&D. In the recent years, the company launched various products related to VOC sensors and monitors. For instance, in 2018, the company launched wearable portable gas detectors named Honeywell BW Ultra monitors; in 2017, it launched Sensepoint XCL, a Bluetooth-enabled, fixed gas detector for commercial, light industrial applications. In May 2018, Honeywell (US) launched connected, wearable portable gas detectors named Honeywell BW Ultra monitors that enable safety for workers in dangerous, confined spaces. In March 2018, the United States Environmental Protection Agency (US EPA) announced a 5-year Cooperative Research and Development Agreement (CRADA) with Aeroqual (New Zealand). In October 2017, Aeroqual (New Zealand) launched an AQS monitoring platform. This product is cheaper, smaller, and of lower power than AQM65. Nitrogen dioxide (NO2), ozone (O3), and particulate matter are the 3 main air pollutants in modern cities. NO2 and particulate matter are emitted directly by vehicles, and O3 is created when NO2 and VOCs combine in the presence of sunlight. What are the emerging applications of VOC sensors and monitors? How are the advancements in the gas sensor industry influencing the VOC sensors and monitors market? Which device type is expected to have a significant penetration in the VOC sensors and monitors market during the forecast period? Which countries are expected to witness significant growth in the VOC sensors and monitors market in the next 5 years? The study involved 4 major activities carried out to estimate the current size of the market for volatile organic compounds (VOC) sensors and monitors. Exhaustive secondary research was conducted to collect information on the market along with its peer and parent markets. The next step was to validate these findings, assumptions, and sizing with industry experts across value chain through primary research. Both top-down and bottom-up approaches were employed to estimate the complete market size. Thereafter, the market breakdown and data triangulation were employed to estimate the size of the market based on segments and subsegments. In the primary research process, various primary sources from both supply and demand sides have been interviewed to obtain qualitative and quantitative information important for this report. 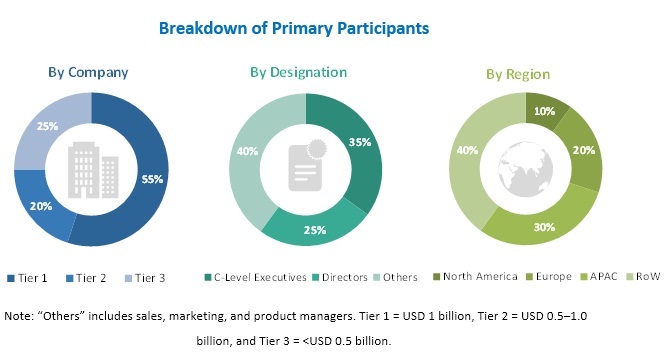 The primary sources from the supply side included industry experts such as CEOs, VPs, marketing directors, technology and innovation directors, and related executives from key companies and organizations operating in the VOC sensors and monitors market. After complete market engineering (including calculations regarding market statistics, market breakdown, market size estimations, market forecasting, and data triangulation), extensive primary research was conducted to gather information as well as verify and validate the critical numbers arrived at. In the complete market engineering process, both top-down and bottom-up approaches have been implemented, along with several data triangulation methods, to estimate and validate the size of the VOC sensors and monitors market and other dependent submarkets listed in this report. After arriving at the overall market size from the estimation process explained above, the overall market was split into several segments and subsegments. To complete the overall market engineering process and arrive at the exact statistics for all segments and subsegments, market breakdown and data triangulation procedures were employed wherever applicable. The data were triangulated by studying various factors and trends identified from both demand and supply sides in industrial and nonindustrial verticals. This research report categorizes the VOC sensors and monitors market based on device type, application, and region.